More people bought CoD MewTwo on opening day than any other game in history - and more people pirated it than any other game this year, too. In case you've been living under a rock for the past two months, Modern Warfare 2 is a pretty popular game. How popular, you ask? Popular enough to become the biggest entertainment launch of all time, raking in a half-billion dollars in one week. Millions upon millions of people bought the Infinity Ward shooter for all three platforms - yes, even the controversy-ridden PC version - and it is far and away the best-selling game of the year. 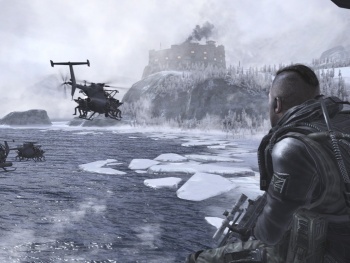 But with its popularity comes a more dubious award: More people may have bought MW2 than any other game this year, but more people also downloaded it illegally, too. According to TorrentFreak, more than 4.1 million people downloaded the torrent of the PC version alone - more than double that of last year's "champion," Spore - while a comparatively meager 970,000 downloaded it for the Xbox 360 (still enough to top the list, of course). Following in its heels were the extremely pirated Sims 3 on PC with 3,200,000, and Street Fighter IV on Xbox 360 with 840,000 - and on Wii, New Super Mario Bros. Wii K.O. 'd Punch-Out! !, 1,150,000 to 950,000. This, of course, is unsurprising, given A.) how popular MW2 is and B.) how irritated the PC market seemed to be at Infinity Ward. While Infinity Ward's move to a proprietary gaming service, IWNet, probably dissuaded some pirates from playing online, its effect seems to be negligible. Of course, it doesn't make piracy any more justifiable, either. It's perfectly fine to be disappointed in a game - even angry at the makers - especially with very legitimate reasons, but if you don't pay, you shouldn't get to play.